The river Thames runs through the heart of London, it was after all the main transportation route into and out of the city until recent times. 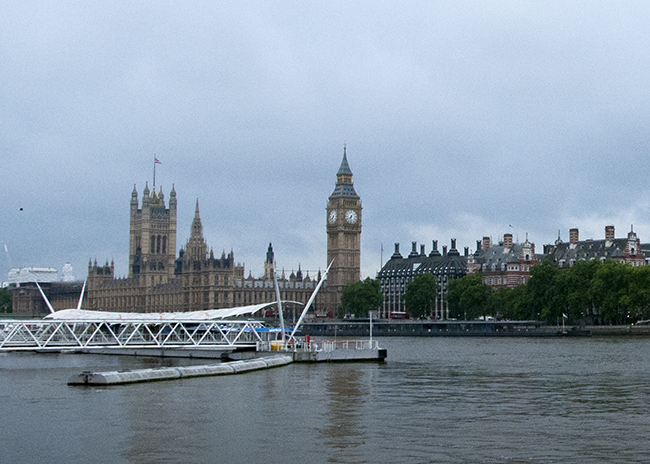 As a result much of what makes London, London is ideal placed to be viewed from the river, making it an ideal way – particularly for the first time visitor – to get a an overview of the place. Rather than a hop on hop off bus it can, especially in the warm summer months when the city is at its busiest, make more sense to make the River your friend and buy an all-day River Roamer (buy online from www.thamesclippers.com for GBP14.70 per adult, GBP 7.35 for a child or GBP32.50 for up to 2 adults and 3 children under 16 – prices as at 1 Jul 2015) This ticket will give you unlimited access for a day to visit anywhere from Vauxhall to Woolwich (they are not valid on RB6 to/from Putney). My recommendation for the day would be to have breakfast and head out to your start point at the London eye (closest tube is either Westminster and walk across the bridge or Waterloo). Although tickets are only valid for travel from 9 am I would aim to get there a bit early to avoid the crowds and to get your day started as there’s a lot to see. Before heading to the river visit the area around the Palace of Westminster and Westminster Abbey on the northern bank of the river then cross and perhaps look in on the Aquarium and the London Eye on the south bank. Once you’ve satisfied yourself here, head to the wharf and hop on the RB1 service to Bankside Pier. There are three main areas to visit here. 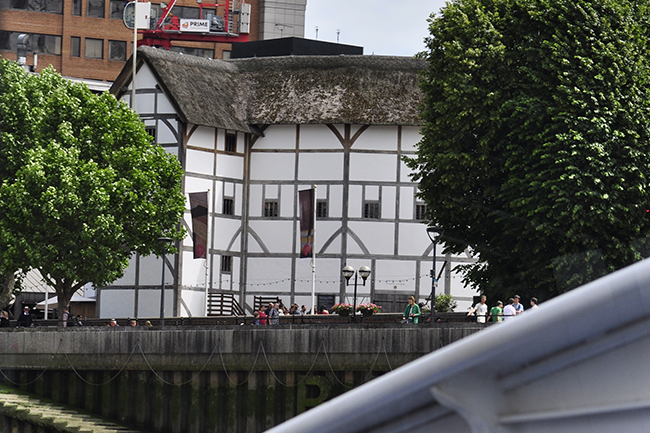 My suggestion would be to start at Shakespeare’s Globe Theatre before walking across the Millennium Bridge to St Paul’s Cathedral, and then on the way back to the Bankside Pier pop in to the Tate Modern Gallery. 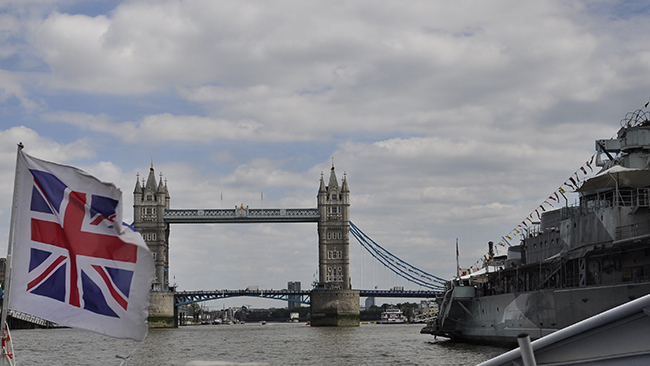 Now rejoin the ferry at Bankside and sail down past the battle ship HMS Belfast to Tower Millennium Pier. This port is right beside the Tower of London and Tower Bridge and if I were you then don’t miss the opportunity for a coffee/drink in the wonderful St Katherine’s Dock before heading down to Greenwich. Tower Bridge from the river with HMS Belfast on the right hand side of the image. In Greenwich those looking for a bit of history and culture can opt to visit the Cutty Sark, Old Royal Naval College, Queen’s House, National Maritime Museum or the Old Royal Observatory (Greenwich Mean Time – GMT – anyone!) . Those looking for a more modern London experience can walk through the park to Blackheath and/or visit the markets in Greenwich. In reality, if one tried to visit all of these locations it would take considerably longer than one day (even a summers one with long evenings) to “do them justice”. Use it as an opportunity to get a taste of each area in order to decide which ones to return to and spend more time exploring. Look out for additional blogs on each of these areas and why not plan to put this trip together with these three day trips to make a great 4 day London short break.